Beachfront land for a dream estate. 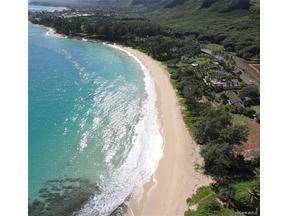 Quiet, hidden Oahu beach with white sand and swimmable sand-bottom beach. The lot is graded and filled and compacted to 10 feet, sits above flood plain, with Elevation Certificate. Great for beach walks, picturesque "Pounder's rock" located to the north and a long sandy beach to south. Across the street is a tropical rainforest waterfall hike. Entitled for 2 separate lots. There are 2 sets of building plans currently in for permitting for 2 new beachfront homes. Existing old small home. Improvements do not agree with tax records. Courtesy of Eovino & Associates, Inc.